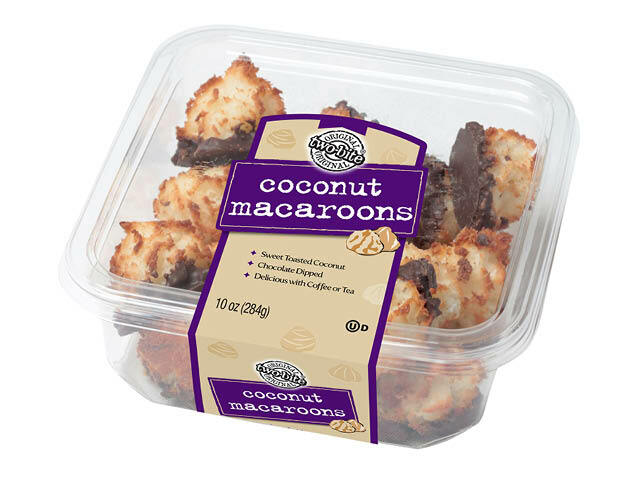 Co-co-coconut cravers rejoice: Macaroons come in tasty two-bite® bursts of pure, simple, fun flavor. Real eggs and shredded coconut join forces for a crispy crunch on the outside and moist, chewy goodness on the inside. 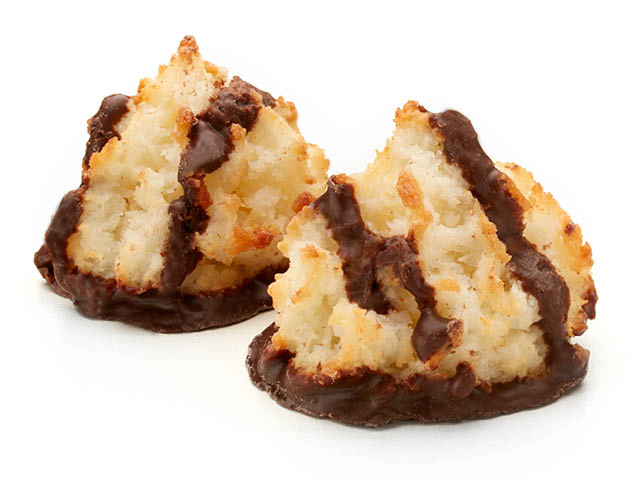 Try a two-bite® macaroon in chocolate, chocolate-dipped or drizzled. And purists can always go for the classic, plain variety (a favorite everywhere). A must-have for holiday celebrations, or even a casual get together. 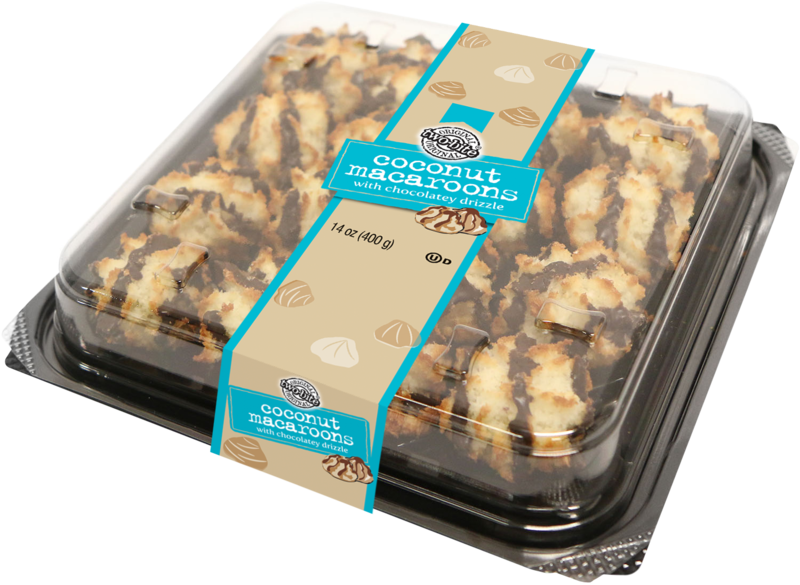 Delicious coconut macaroons drizzled with chocolate, arrayed on a tray ready for entertaining. Simply open and serve! INGREDIENTS: COCONUT, SUGAR, EGG WHITES, CHOCOLATE FLAVORED COATING (SUGAR, MODIFIED PALM AND/OR MODIFIED PALM KERNEL FAT, COCOA POWDER [PROCESSED WITH ALKALI], SOYBEAN LECITHIN, VANILLA EXTRACT), WATER, ENRICHED WHEAT FLOUR (WHEAT FLOUR, NIACIN, REDUCED IRON, THIAMINE MONONITRATE, RIBOFLAVIN, FOLIC ACID), GLUCOSE, SALT, NATURAL FLAVOR, MOLASSES. CONTAINS WHEAT, EGG, SOYBEAN, COCONUT. MAY CONTAIN MILK AND OTHER TREE NUTS. Chocolate coconut goodness on the go! 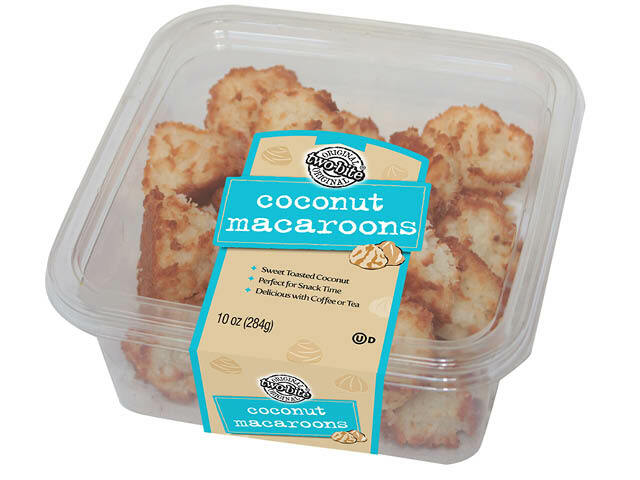 Crunchy, sweet mini coconut macaroons, dipped and drizzled in chocolate, all in a convenient portable pack. INGREDIENTS: COCONUT, SUGAR, LIQUID EGG WHITES, CHOCOLATE COATING [SUGAR, PALM AND PALM KERNEL OILS, COCOA POWDER (PROCESSED WITH ALKALI), SOYBEAN LECITHIN, NATURAL FLAVOR], ENRICHED WHEAT FLOUR (WHEAT FLOUR, NIACIN, REDUCED IRON, THIAMINE MONONITRATE, RIBOFLAVIN, FOLIC ACID), CORN SYRUP, WATER, VINEGAR, SALT, POTASSIUM SORBATE (PRESERVATIVE), ARTIFICIAL FLAVOR. CONTAINS WHEAT, EGG, COCONUT AND SOYBEAN. 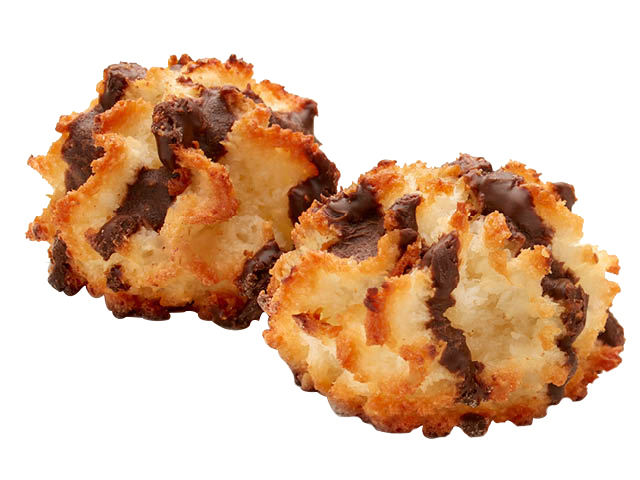 Impossible to improve on the classic macaroon? Not at all. 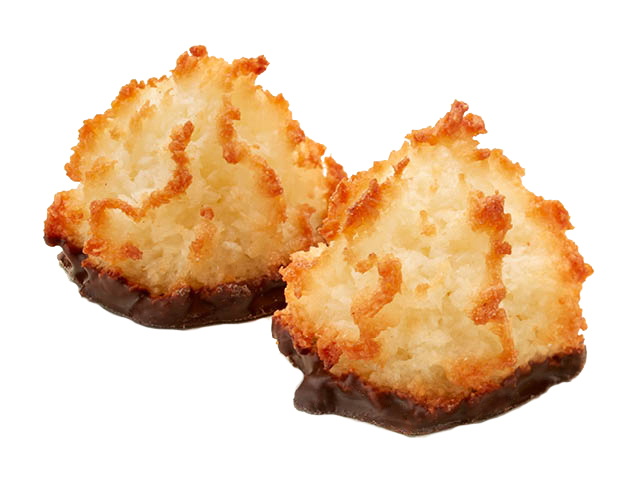 We start with our fantastic two-bite® macaroons and dip them in rich chocolate. Wondrous! INGREDIENTS: COCONUT, SUGAR, EGG WHITE, CHOCOLATEY COATING [SUGAR, MODIFIED PALM AND PALM KERNEL OIL, COCOA POWDER (PROCESSED WITH ALKALI), SOYBEAN LECITHIN, NATURAL FLAVOR], ENRICHED WHEAT FLOUR (WHEAT FLOUR, NIACIN, REDUCED IRON, THIAMINE MONONITRATE, RIBOFLAVIN, FOLIC ACID), WATER, CORN SYRUP, SALT, NATURAL FLAVOR. CONTAINS WHEAT, EGG, SOYBEAN AND COCONUT. 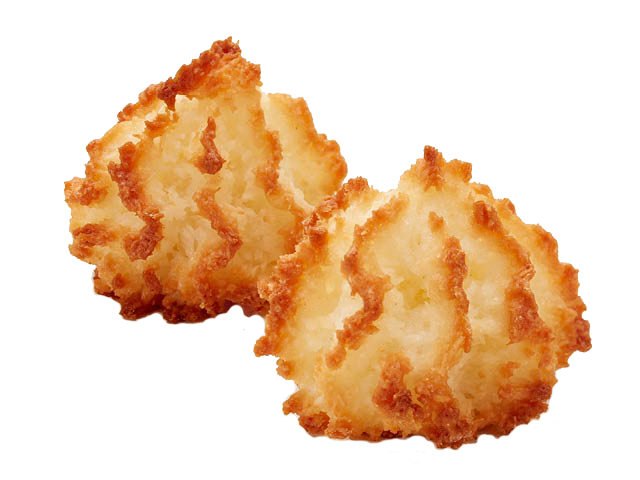 This is the traditional coconut macaroon as only two-bite® can make it. 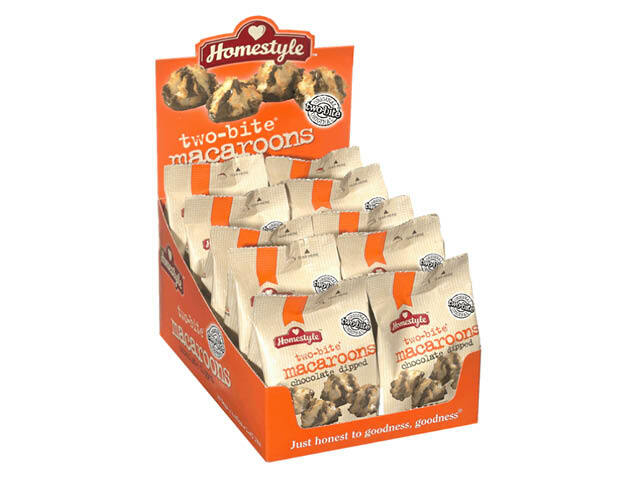 Coconut lovers rejoice! 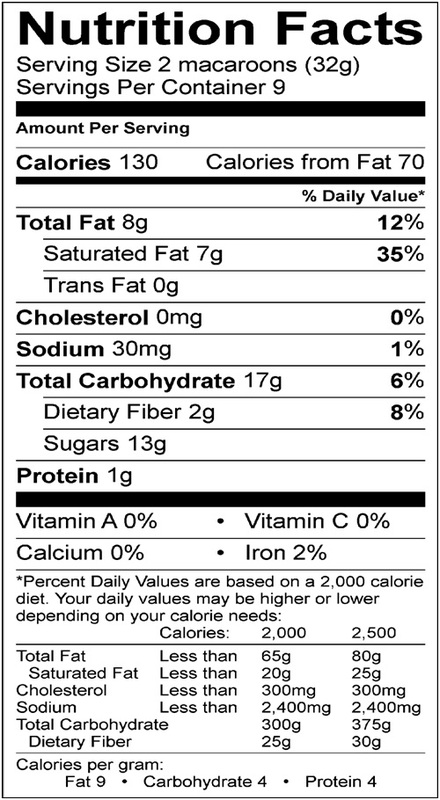 INGREDIENTS: COCONUT, SUGAR, EGG WHITE, ENRICHED WHEAT FLOUR (WHEAT FLOUR, NIACIN, REDUCED IRON, THIAMINE MONONITRATE, RIBOFLAVIN, FOLIC ACID), WATER, CORN SYRUP, SALT, NATURAL FLAVOR, SOYBEAN LECITHIN.